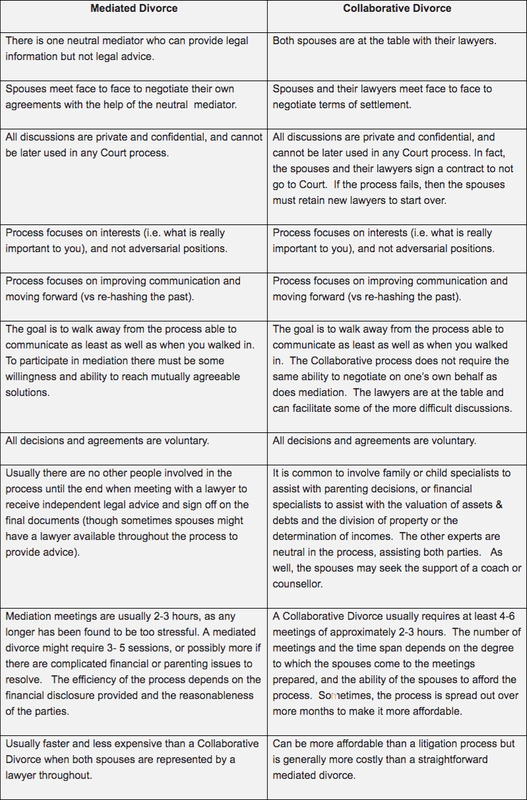 Mediation – for a Good Divorce! Are you looking for a way to divorce on your own terms? To keep costs down? And to not have the conflict escalate? A mediated divorce might be a good option for you. 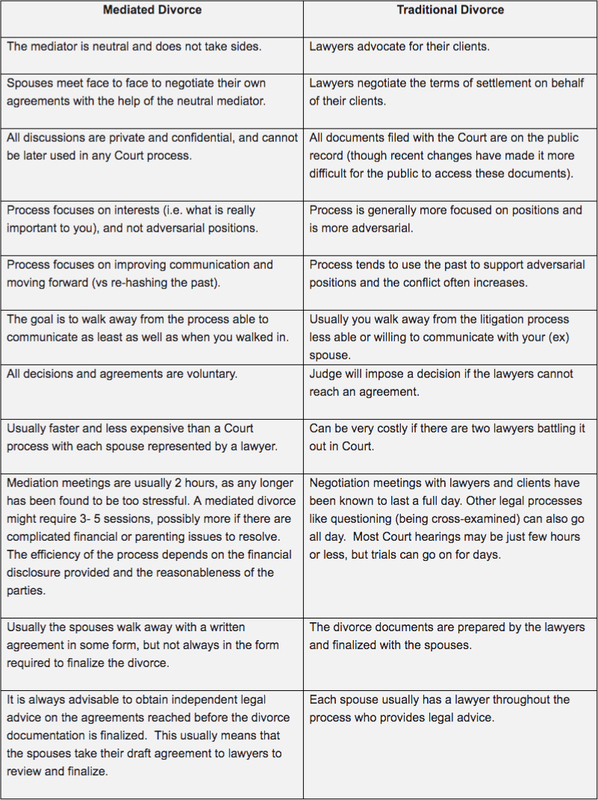 What is the Advantage of a Lawyer-Mediator? You are advised before the process what you need for a cost-effective and efficient mediation. Coming to the table prepared makes the process less expensive and stressful. You have access to legal information throughout the mediation process, for no extra charge. You share the costs for a neutral lawyer mediator who can identify the legal issues and the need for independent legal advice early in the process, potentially saving time and money. You have a neutral lawyer mediator who can identify the need for other professionals such as pension valuators, business valuators, financial planners, accountants, psychologists, parenting experts, etc. You avoid finishing your mediation and then finding out from a lawyer that there are legal issues that must be addressed, possibly opening up the entire mediated agreement, incurring further legal bills. You walk away with a Separation Agreement, a Parenting Plan, if applicable, and divorce papers in a format ready for independent legal advice, signing and filing with the Court. You are less likely to have complications in the future resulting from a settlement that did not address a key legal issue.sue. Is Child-Inclusive Mediation an Option for your Family? Child-inclusive mediation ensures the experiences, concerns, views and preferences of children inform the adult negotiations over custody and parenting. The needs and best interests of the children are held front and centre in the mediation, without the children participating in the mediation. Child inclusion is about giving children the right to present their wishes in Family Law processes and to have their parents take their experience into consideration. Children can have their voices heard by the mediator (or an independent Child Consultant or Psychologist), without fear of upsetting either parent. Child inclusive mediators are trained in meeting with children to ensure children feel safe and nothing is communicated to the parents unless the children are comfortable with their parents knowing. Children are never asked to make choices. The ages of the children, whether there has been alienation, and the readiness of parents to receive and hear the input of children are all factors in determining if child-inclusive mediation is appropriate. What are the Costs of a Mediated Divorce? What is the difference between a mediated divorce and a ‘traditional’ divorce? What is the difference between a mediated divorce and Collaborative Divorce?